This has not been updated for Clawpack-5 yet, but it should still work if you start up an instance as described below and then install Clawpack-5 by following the Installation options. 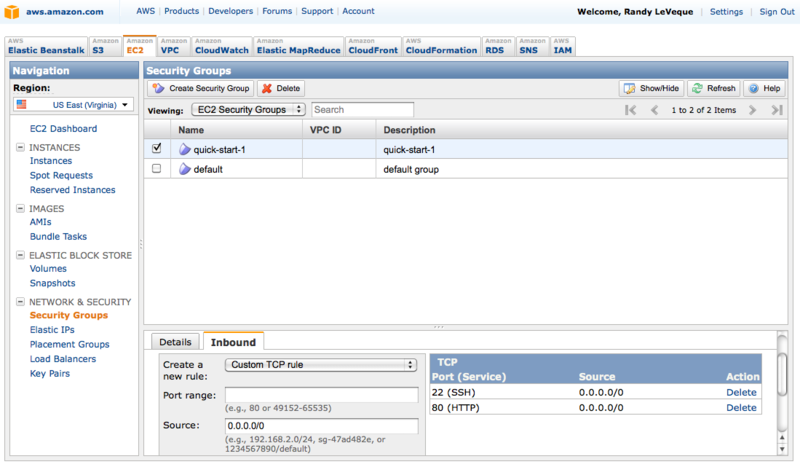 To run Clawpack in the Cloud using Amazon Web Services Elastic Cloud Computing (EC2), first sign up for an account. Note that you can get 750 hours free micro instance usage (which may be sufficient for many things) in the free usage tier. 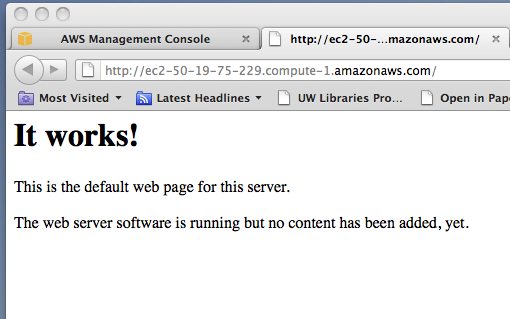 UW eScience information on AWS. Getting started with EC2, with tutorial to lead you through an example (a similar tutorial geared to Clawpack is included below). Pricing. Note: you are charged per hour for hours (or fraction thereof) that your instance is in running mode, regardless of whether the CPU is being used. Once you have an AWS account, sign in to the management console and click on the EC2 tab, and then select Region US East (which has cheaper rates) and click on AMIs on the menu to the left. 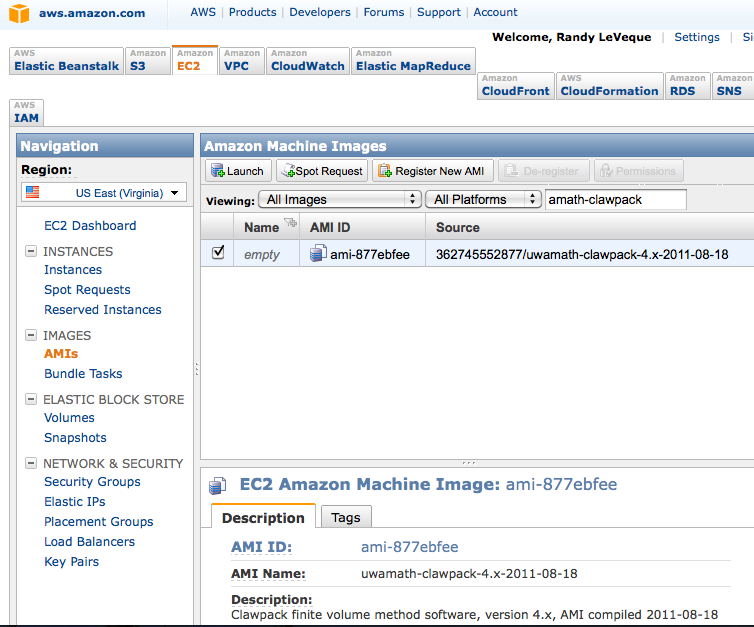 Select the Clawpack image and then click on the Launch button on this page to start launching an instance based on this AMI. This means a virtual machine will be started for you, initialized with this disk image (which is a Ubuntu linux distribution with Clawpack and its dependencies). 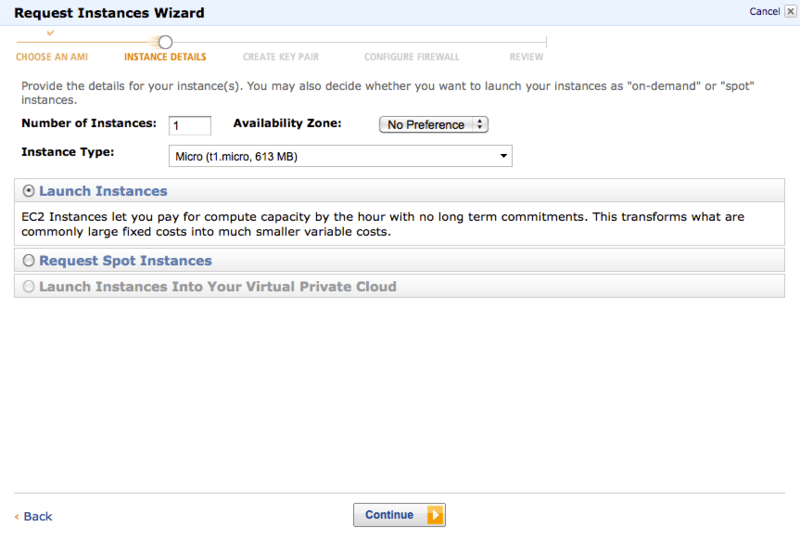 Here you can select what sort of instance you wish to start (larger instances cost more per hour). 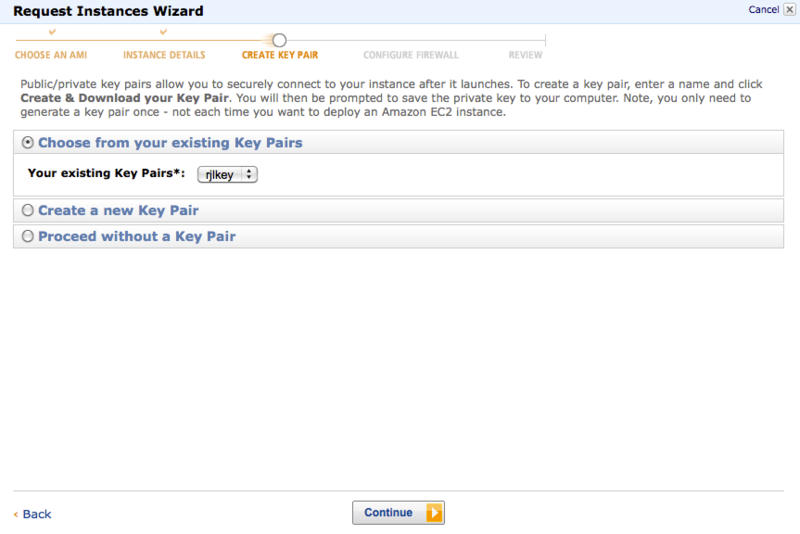 If you don’t already have a key pair, create a new one and then select this key pair here. Click Continue and you will get a screen to set Security Groups. Select the quick-start-1 option. On the next screen click Launch . Click Close on the next page to go back to the Management Console. 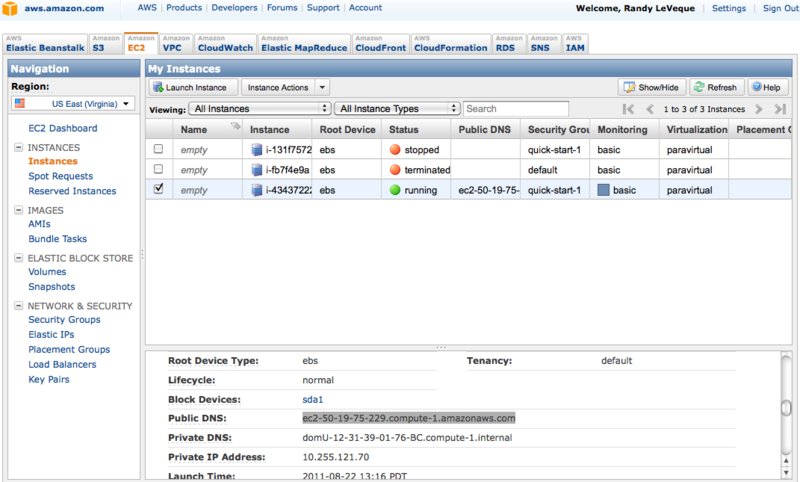 Click on Instances on the left menu and you should see a list of instance you have created, in your case only one. If the status is not yet running then wait until it is (click on the Refresh button if necessary). You must log in as user ubuntu. Other software is easily installed using apt-get install . The $CLAW variable is set to point to this version of Clawpack (in the .bashrc file). Of course you could instead download a tar file of Clawpack and install following the instructions at Installation options. At any rate, see that section for instructions on what to do next if you are new to Clawpack. If you want to use Clawpack-5, instead follow the Installation options. If you are on a computer that supports X windows and you add the -X flag to your ssh command, then you should be able to plot interactively (see Interactive plotting with Iplotclaw). Response may be pretty slow, however. then you will have a directory (named _plots by default) that contains .png figures and .html files for viewing them. You can tar this directory up and transfer it to your local machine using sftp , and then view locally. Note that the plot files are often much smaller than the Fortran output files in _output , and so much quicker to transfer. You can view the plots directly using a web browser as explained in the next section. to make a set of plot files and html files for viewing them, you can view them directly by opening a web browser to an appropriate path on your instance. The page being displayed can be found in /var/www/index.html on your instance. Any files you want to be visible on the web should be in /var/www , or it is sufficient to have a link from this directory to where they are located (created with the ln -s command in linux). for the above example. You will have to replace the DNS with that of your instance. You can use scp to transfer files between a running instance and the computer on which the ssh key is stored. where DNS is the public DNS of the instance and REMOTE-DIRECTORY is the path (relative to home directory) where you want the file to end up. You can leave off :REMOTE-DIRECTORY if you want it to end up in your home directory. $ scp -i KEYPAIR-FILE ubuntu@DNS:FILE-TO-GET . to retrieve the file named FILE-TO-GET (which might include a path relative to the home directory) into the current directory. Once you are done computing for the day, you will probably want to stop your instance so you won’t be charged while it’s sitting idle. You can do this by selecting the instance from the Management Console / Instances, and then select Stop from the Instance Actions menu. You can restart it later and it will be in the same state you left it in. But note that it will probably have a new Public DNS! If you add additional software and want to save a disk image of your improved virtual machine (e.g. in order to launch additional images in the future to run multiple jobs at once), simply click on Create Image (EBS AMI) from the Instance Actions menu.